Sega Display, Aluminum Sign, 6" x 24". Xbox Display, Microsoft Xbox Aluminum Sign, Xbox Original 6"x24". Atari Display, Aluminum Sign, 6" x 24". fistsoffleury93 has no other items for sale. 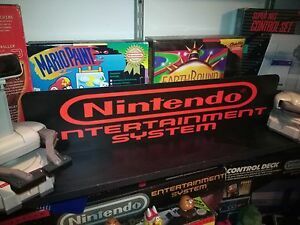 Details about NES Display, Nintendo Entertainment System, Aluminum Sign, 6" x 24". Great seller would buy again!! Awesome signs for my gaming collection! Super Fast Shipping! Great Seller! Fast shipping! Thanks a ton! Good quality.